concert in Atlanta, Georgia. The CHA noted that hamsters "often succumb quickly to illness and death" when they undergo a "sudden environmental change." Justin Bieber performing at a 2011 concert. Photo by Adam Sundana. Bieber's gift was likely a spontaneous one. Bieber often took Pac along on his tours, and on this occasion, he handed the little guy over to a fan. New hamster owner Victoria Blair says the gesture "made her Christmas." She reports that Pac is doing well. She told Celebuzz, "He's fine. He sleeps during the day and plays at night -- he's acting like a normal hamster." 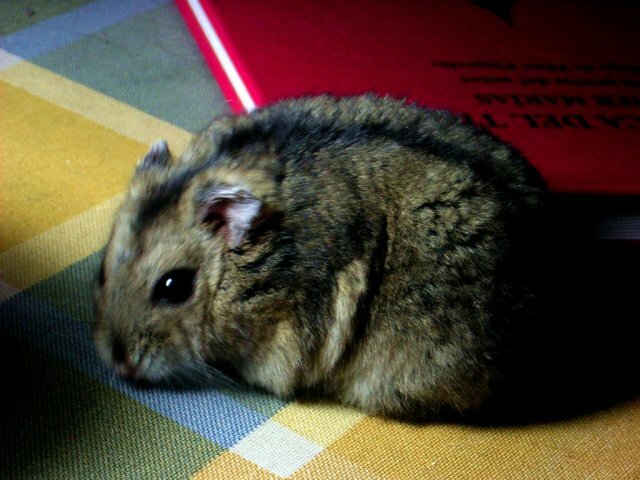 Pet hamster (not Pac). Photo by Ernesto Azuar Valenzuela. While the CHA still doesn't approve of how Bieber handed off his hamster, a spokesman says the organization has "no ill will" toward the pop star. New owner Harris plans to bring Pac to Bieber's Birmingham, Alabama concert in January. Simon's Cat in "Screen Grab" -- The Animal Video of the Day!! !